Teach math by playing interactive games with children. Kids love learning math by playing. Math ppt games encourage interactive study amongs kids. Suitable in class for teachers and at home for parents. Quizzes are in the form of MCQs, gap fill exercises, matching exercises & sequence ordering. It gives children a chance at self study. Domyassignments website helps students with their math assignments. Parents, teachers and educators can now present their knowledge using these vividly presented short ppt presentations. Simply let the kids watch and learn. Quizzes are designed around the topics like addition, subtraction, geometry, shapes, position, fractions, multiplication, division, arithmetic, algebra etc. Gain access the materials by looking at topics - Addition, Subtraction, Multiplication, Geometry,fractions,Trigonometry, algebra, Decimals, Division . Board Games, PDF Worksheets & Interactive Math Games for Children. Math worksheets on this site are printable PDF exercises of the highest quality.Some are in the form of board games, card games, puzzles or simple exercises that can be printed out as handouts. Math games have been carefully designed and arranged by topic to suit the needs of children from kindergarten , first grade, second grade, third grade, fourth grade, fifth grade and sixth grade. The following topics have been covered in the forms mentioned above. These are flash quizzes aimed at testing pupil's understanding of different topics. Results are displayed at the end of each quiz. Each exercise can be praticed several times and each time, the score is shown to enable children to easily assess their level of undertsanding of each topic. 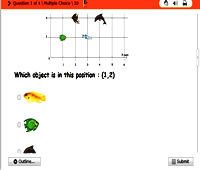 These quizzes are : multiple choice math quizzes, gap fill quizzes, matching exercises, hotspot quizzes with graphics and more for interactive math practice. These are also made more interesting through coolmath games that go alongside each topic. Math games for Children is an excellent mathematics website for parents and teachers who wish to help their children or pupils get better math practice. The materials can be used at school or at home.